Supported ourselves with proficient amenities, we are readily instrumental in providing an inclusive variety of Sleeve Applicator with Tunnel. 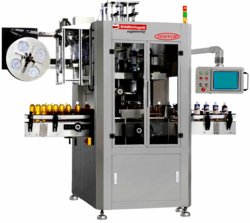 We arew leading supplier of Shrink Sleeve Label Machine. 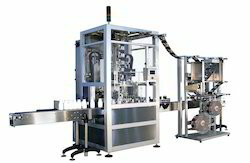 Shrink Sleeve Label Machine is design to insert sleeve with desired position on various size and shape of containers. This unique model is suitable for variety of industries with an opportunity to reduce labour and increase manufacturing rates. Our Automatic Sleeve Applicator Cap from Aurum can be easily integrated with existing line. Sleeve Applicator Cap is designed for automatically inserting the heat shrinkable PVC and PET sleeves of desired height on bottle caps. Cap Sleeve application helps in avoiding adulteration and duplication of products. : Fully automatic operation Fitted with digital PLC control. : No bottle - No sleeve feature (eliminates wastage). : Can handle round glass/plastic bottles. 1. Fully automatic operation Fitted with digital PLC control. 2. No bottle - No sleeve feature (eliminates wastage). 4. Can handle round glass/plastic bottles. With thorough understanding of the relevant industry, we are offering a commendable range of Water Bottle Sleeve Applicator. These products satisfy all aspects of quality, set by the international market. We offer neck shrink sleeve applicator to our clients. Magic SPM offers Shrink Sleeve Applicator from 50 bpm to 300bpm which applies full height sleeves or tamper evident neck Bands. Magic SPM manufacturers all models for applying heat shrinkable sleeve label or neckbands which is commonly used on most food packages ranging from Bottles, yoghurt Cup.